North Korean embassy and Moscow politicians speak out against screening of controversial U.S. film ‘The Interview,’ in which two American TV reporters kill Kim Jong-un. The government of North Korea believes that the U.S. film The Interview, about the assassination of North Korean leader Kim Jong-un, represents "dangerous filmmaking, which justifies and encourages terrorism," according to a statement made by the North Korean embassy in Russia. "This film should be banned in all countries," states the embassy's communiqué. "It is hard to believe that in such a friendly and civilized country such as Russia they will show a film about the assassination of the head of a friendly and sovereign state." According to North Korean diplomats, such a film shows "the ethical immaturity and the moral depravity" of the U.S.
On Dec. 25, Special Russian Presidential Representative for International Cultural Cooperation Mikhail Shvydkoi and the Russian Foreign Ministry spoke out against showing the film in Russia. Shvydkoi underlined that Russia and North Korea "have certain historical relations" and remarked that compatriots "do not have a tradition of offending one another's presidents." A day earlier the film appeared on Russian torrent trackers. Legal internet and online movie theaters in Russia have said that they still have not received any proposals from Sony Pictures, which owns the rights to the film, but that nevertheless they are interested in it. Sony Picture's Russian representative announced that the "film will not appear on Russian movie screens on January 29, as had been planned" and that "the new date will be announced later." On Dec. 18, 2014, shortly before the film's premiere in New York, Sony Pictures received anonymous threats that a terrorist act would be carried out during the showing. 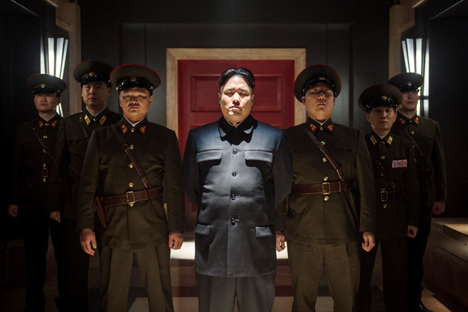 The premiere was thus canceled and major U.S. movie theaters subsequently refused to show The Interview. A day earlier a fragment of the film appeared on the internet, showing Kim Jong-un's death. The entire content of The Interview was stolen by hackers during a cyber attack on Sony Pictures at the end of November. The film's official release took place in the U.S. on Dec. 25, with the film being screened in more than 300 independent movie theaters. The FBI had announced that it would keep a close eye on the holiday showings and that employees of the security organization would attend a series of premieres at different venues. The leading roles in The Interview are played by James Franco (Spiderman, Milk) and Seth Rogen (The Green Hornet). The plot deals with two American television reporters who receive an opportunity to interview Kim Jong-un. But before the trip to North Korea they are recruited by the secret services and are ordered to kill the North Korean leader.